I love how this background looks so soft! I made it by sponging gesso through a stencil first, and then applying two kinds of Distress ink (the regular Distress ink and the new Distress Oxide inks) with a blending tool on top of the gesso. I sprayed the inks with water to blur and soften them, and to create a watery look. I like it! The words “Romance” and “with all my heart” are rub ons. 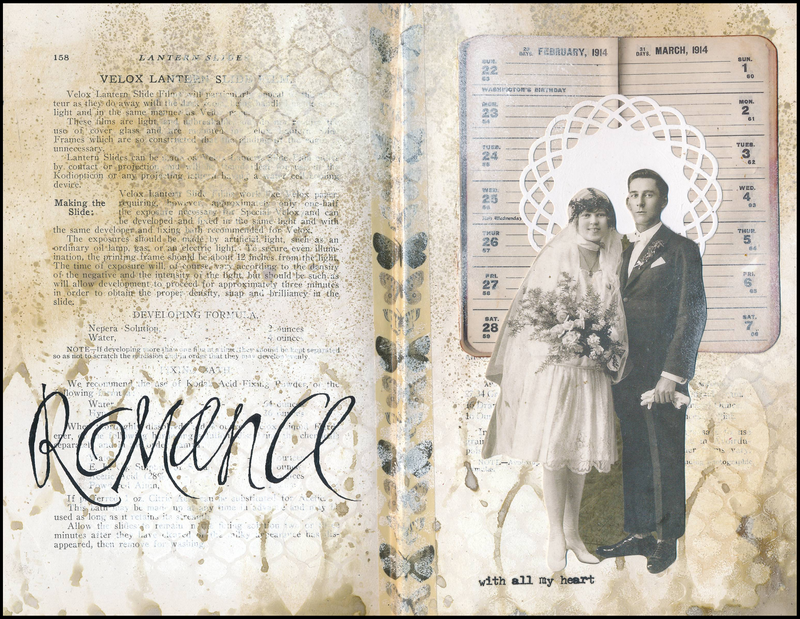 The images on the right side of the page (the calendar page from 1914 and the wedding couple) are Tim Holtz dies. To convert a book into an art journal, I first “thin it” (by tearing or cutting out some of the pages) and then “stiffen” the pages by gluing two or three pages together. Sometimes, this results in the binding splitting — as it did on this page. (Old books, such as this one from 1914, are often fragile!) In this book, I used two different methods to fix a split: washi tape (as I did on this page) or deli paper (more on that later!) Both methods do the trick of securing the pages back together and providing stability for the book.